WORKSHOP & CLASS BOOKINGS tab on the left hand side! 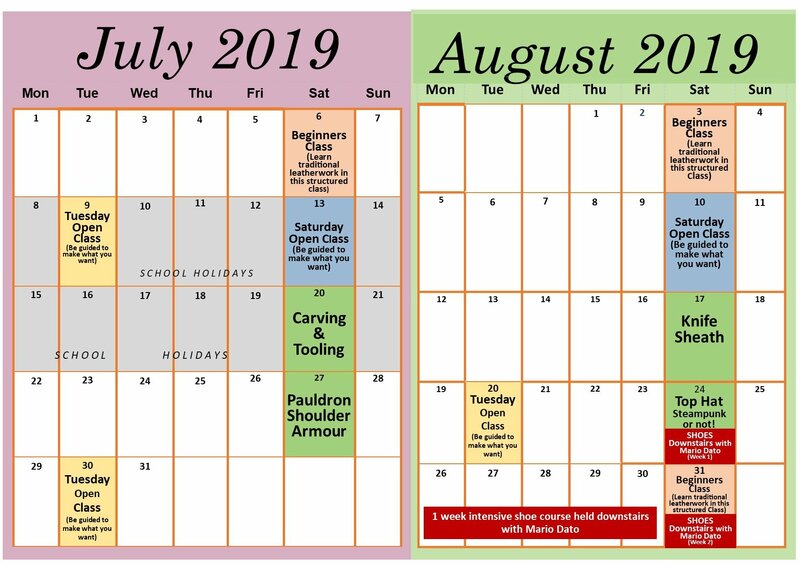 Please note that these dates should be definite but are subject to change, if need be. Also, bookings are not yet taken for some future classes. 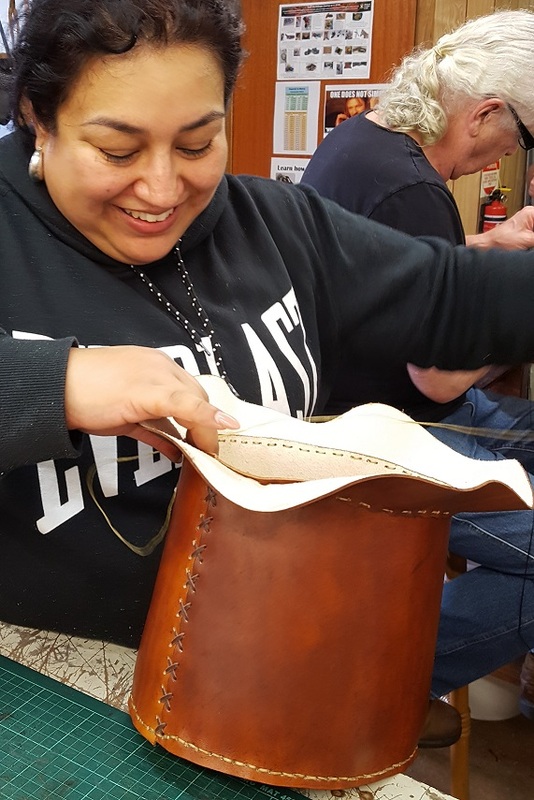 Leathercraft classes are held every Saturday morning from 8.45am -12.45 noon, with "Beginners Classes" and "Open Classes" every month, along with specialty classes slotted in each month. Included regularly are Belt/Dog Collar workshops and Carving & Tooling Workshops. 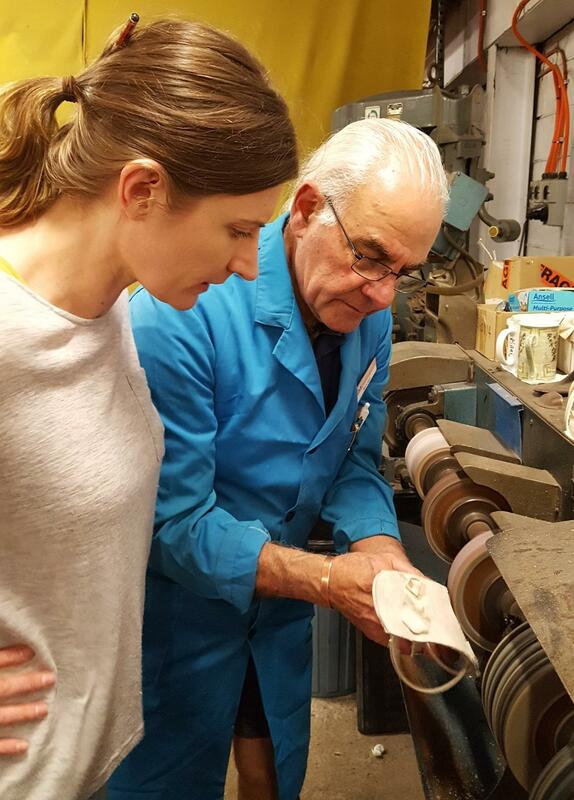 There are also regular shoe making workshops wtih Mario Dato in the downstairs workshop. Saturday Open classes and Tuesday Open classes lets you work on your specific project and you are guided step by step. Its not mandatory to do the Beginners first, but it comes highly recommended!!! Tuesday classes are held once every three weeks, from 10am till 2pm, and are open classes to make what you want and you will be guided. 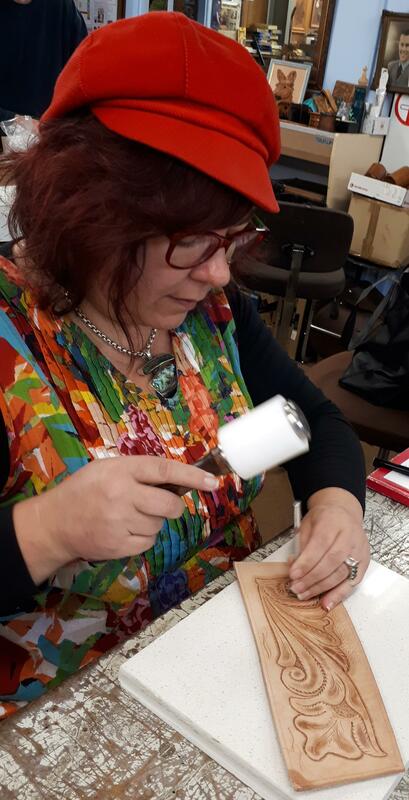 In these casual Beginner Classes you can learn to emboss (stamp), dye, seal, stitch and burnish edges on a simple item like a coaster, working on veg tanned leather. You also have a tour through the store showing all the different types of leathers and exotics. This fun class teaches you the basics that will carry you through all of your projects including tool uses and leather choices. 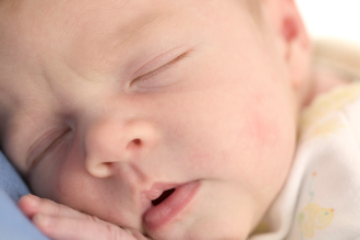 This class opens your eyes to what's available to you, and comes highly recommended. You only need one lesson to set you on your way. 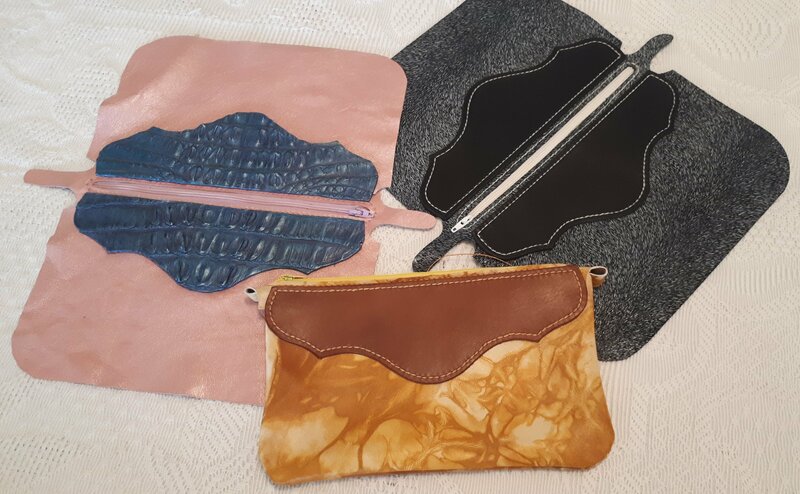 However, if you have ANY particular project in mind - perhaps using chrome tanned leather for a soft handbag for example, this is also achievable without the Beginners Class, and you will be guided on the day. Please note there are no sewing machines in the classroom. All sewing is done by hand. Tuesdays, being a smaller class, are also an Open class to make what you want and you will be be guided step by step. Please Note that if the class contains less than 4 participants, the tutor will guide you step by step, but whilst you are busy, she will continue with other tasks. 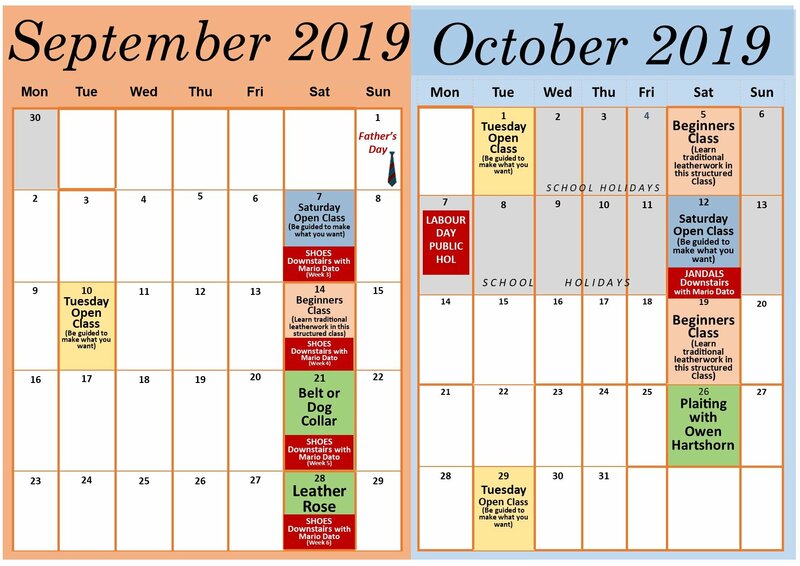 Tuesday Open classes fall once every three weeks. ** PLEASE NOTE, IF YOU HAVE A PROJECT IN MIND, YOU WILL NEED A PATTERN. AS WE ARE NOT PATTERN MAKERS, IT IS UP TO YOU TO DEVISE ONE, PERHAPS FROM AN OLD HANDBAG OR WALLET IF THAT IS WHAT YOU ARE MAKING. 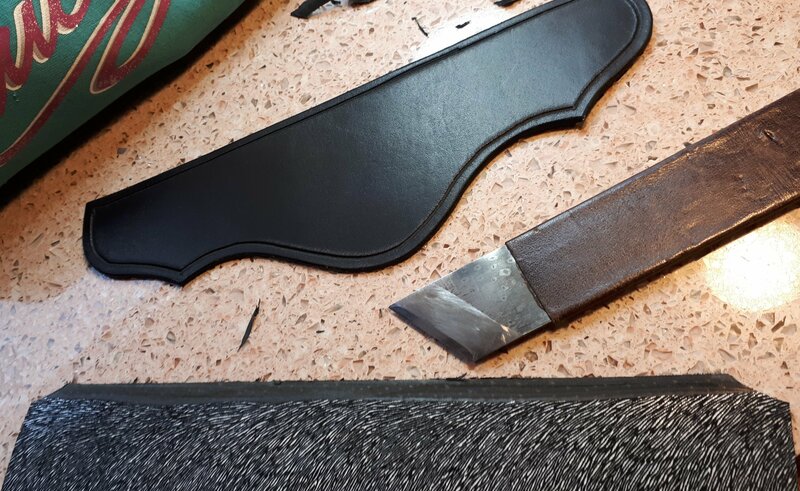 We do have some patterns and templates for leather projects, but best to check with us first. Otherwise, make the pattern out of paper first, get your folds right, then transfer to cardboard. Bring your cardboard peices in, and therefore you have not wasted class time, cutting cardboard. A 5mm seam allowance works for just about everything! 4 hour Saturday Classes and 4 hour alternate Tuesday classes are $50.00 each. 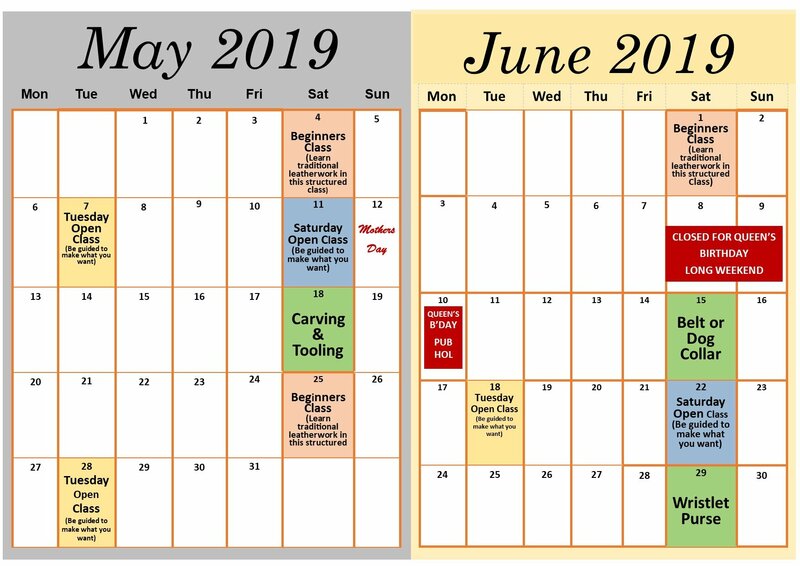 ($55 as of July 1st 2019) Beginners to advanced are all welcome. 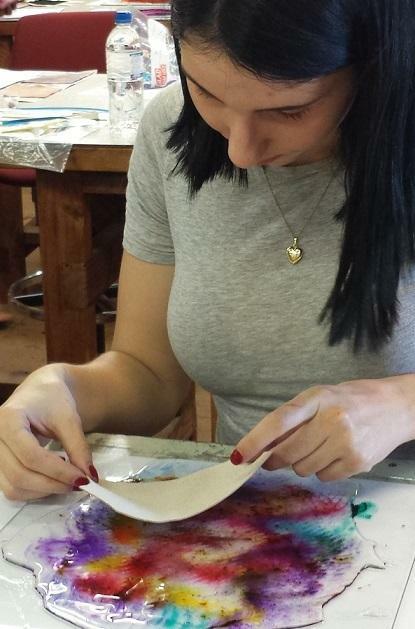 Bookings for all classes are essential and can be booked individually, by the lesson. Come in and join all the fun. Private Tuition is available at $60 per hour for one on one tuition with Silvia Guerrera. 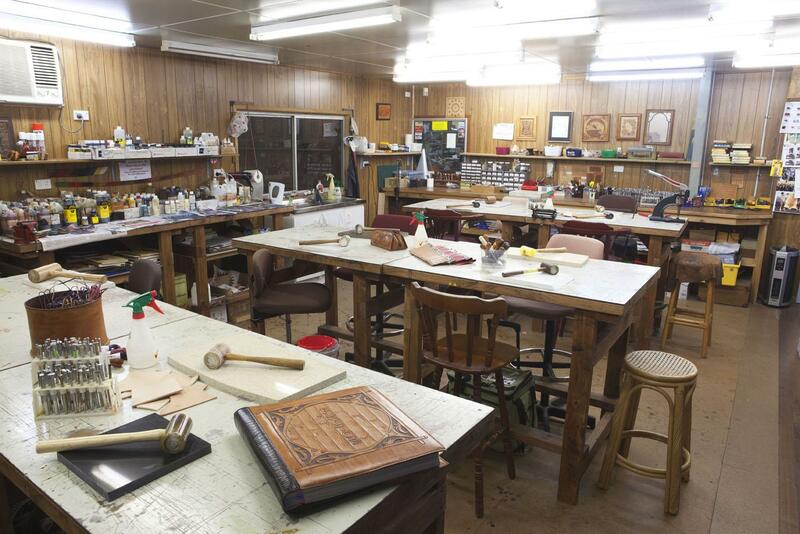 Room Hire: Use of craftroom with no tutor or consumables is available @ $15 per hour. 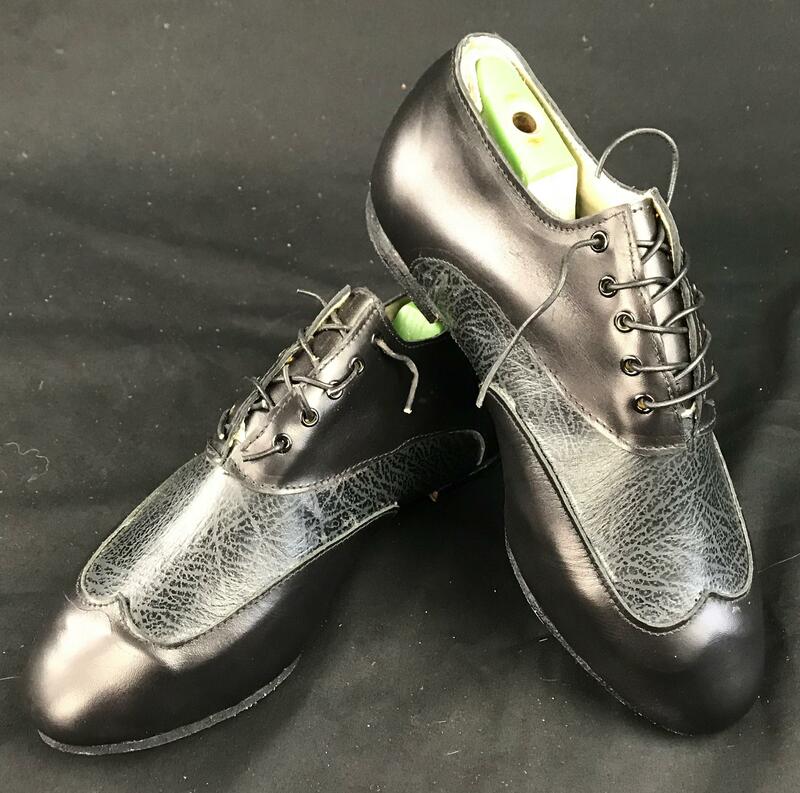 You can also take advantage of the brilliant private tuition you'll receive with Mario Dato at the rate of $60/hour (minimum 2 hours) for shoe making. Email silvia@birdsall-leather.com.au for more info. Book Saturday classes HERE. 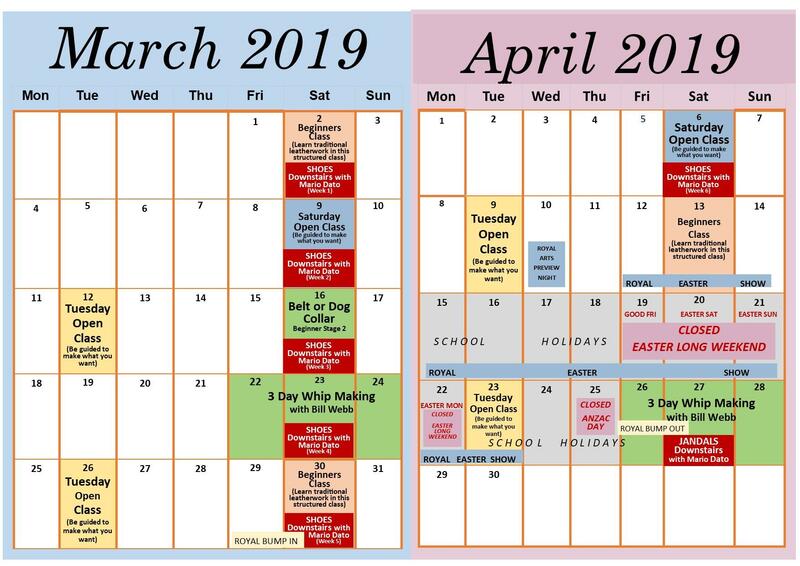 Book Tuesday classes HERE. What a great way to use up your off cuts and scrap leather in this practical and attractive little Wristlet Purse by Don Gonzales. Use leather we provide in this workshop or bring your own offcuts of veg, chrome, hairhide or exotics to pimp up your purse! A rewarding workshop where you will cut out your pieces, secure, punch holes and stitch, learn how to place and sew a zipper and depending on the thickness of your purse, turn your piece inside out or stitch on the outside. Also make a great pencil case or makeup purse! Possibilties are endless! The entire project will be hand sewn using saddle stitch with waxed thread. Take advantage of the $7 healthy lunch option! Examples shown by Don Gonzales have hand carved and tooled veg tanned overlays. The purses in this workshop will be plain as per the time permitted. MAKE A TOP HAT... STEAMPUNK OR NOT! Going to Ironfest, Winterfest, the Medieval Faire, Comicon, Supanova, or just anywhere you want to make a statement? For those Steampunkers / Cosplayers (Literally "Costume Play") / Medieval Re-enactors & Sci Fi fans out there, and as shows like Game of Thrones come to the fore, this is the workshop for you, and it’s a lot of fun! With this genre of costume making, leather is a huge component, and people are flocking to the re-enactment movement and love anything that is as authentic as it comes. 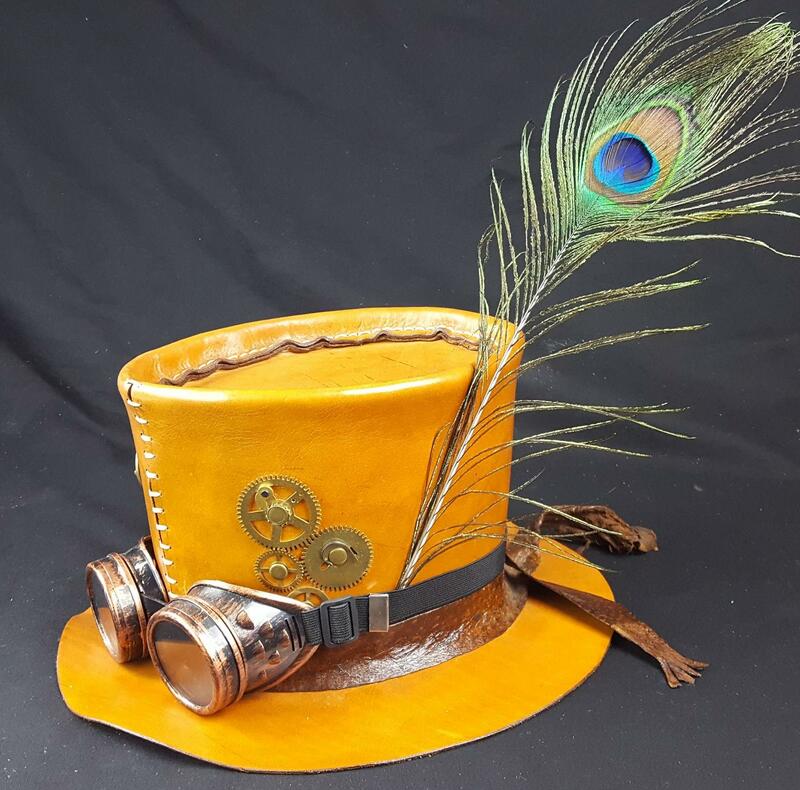 Hence here is the easy-to-make Top Hat where the steampunk theme and cogs are optional! Put some thought into what hat band you may like. Perhaps a vivid exotic snake or eel skin! 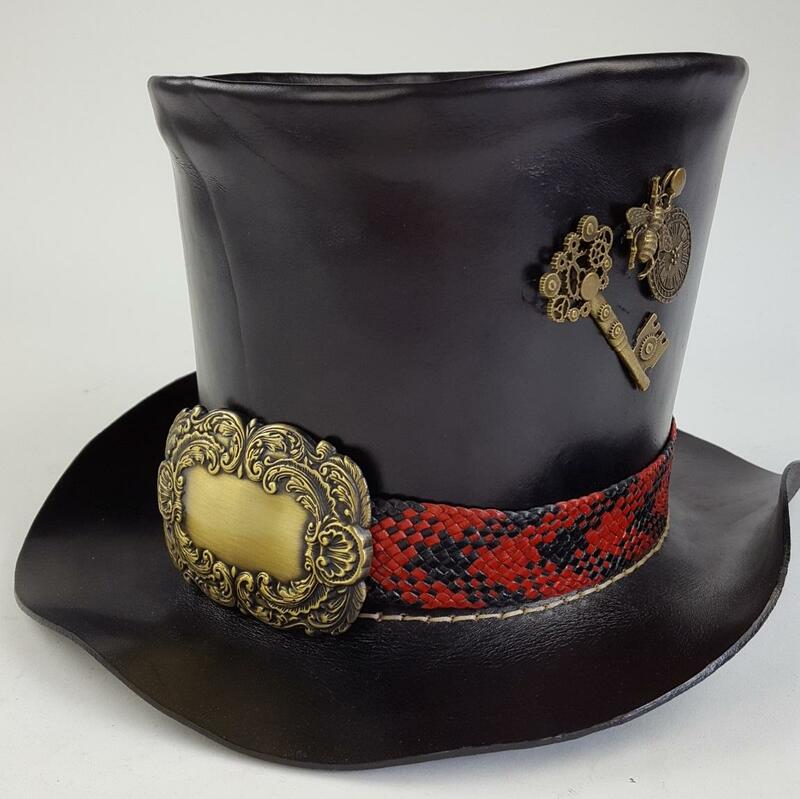 You will be taken through the paces in this full day workshop, including cutting out your template, colouring, stitching and assembling your top hat to your desires. Be prepared to work at a fast pace! You will be shown tips and tricks and also pitfalls with assembly. You can assemble with kangaroo lace or waxed thread and learn the procedure to make yourself another top hat with ease. All tools to share—bring your own if you have them. Take advantage of the healthy $7 lunch option on the day! What is Steampunk? “Its a genre of science fiction that has a historical setting and typically features steam-powered machinery rather than advanced technology. Its essence is neo-Victorian vintage fashion with a modern sassy twist." This has to be one of the most creative and rewarding workshops which is just plain fun! Bring your kids (over 8 yrs) with you! 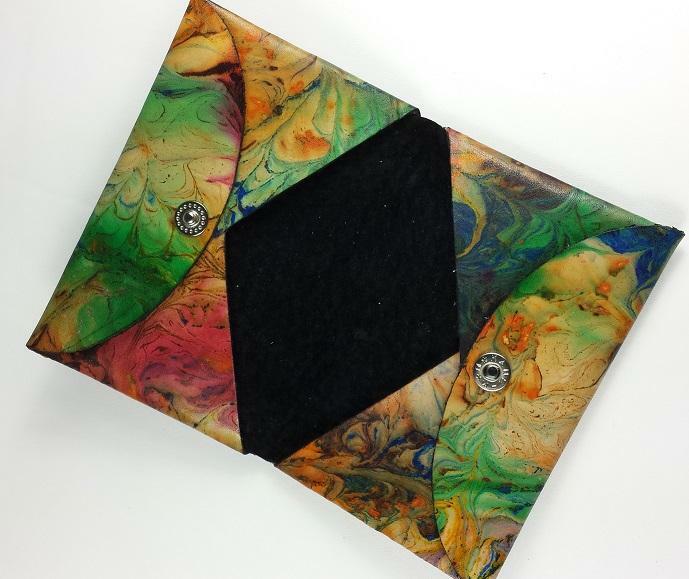 Discover this interesting technique, using marbling gel and dyes to create awesome artwork, on the wonderful medium of leather! Once you refine your marbling skills on leather test pieces, you’ll be marbling this neat little decorative credit card or business card holder with your final marbled piece. 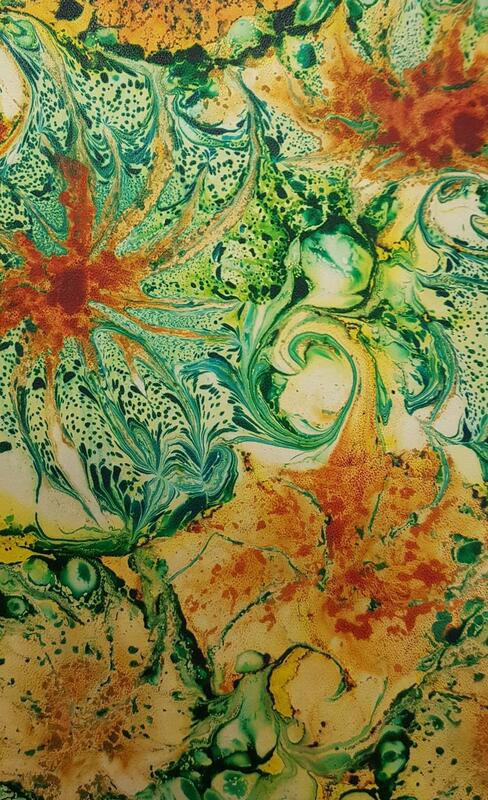 You can then apply marbling to any future project you desire! 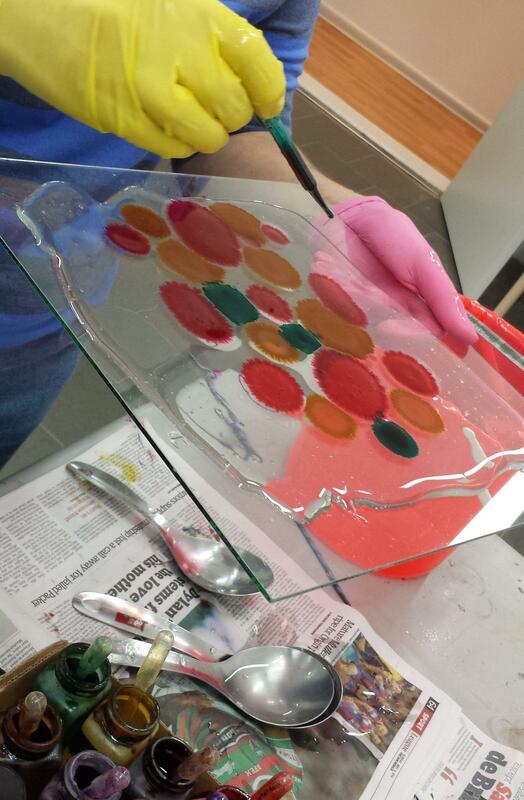 Your white powdered marbling compound will be mixed with water the night before, ready to use. It will resemble wallpaper glue in its clear paste form. Once you add colour and imagination, watch your cool creations evolve and come to life. They really are amazing! Ironfest, Winterfest, St Ives Medieval Faire, or for no reason at all, lets make armour. 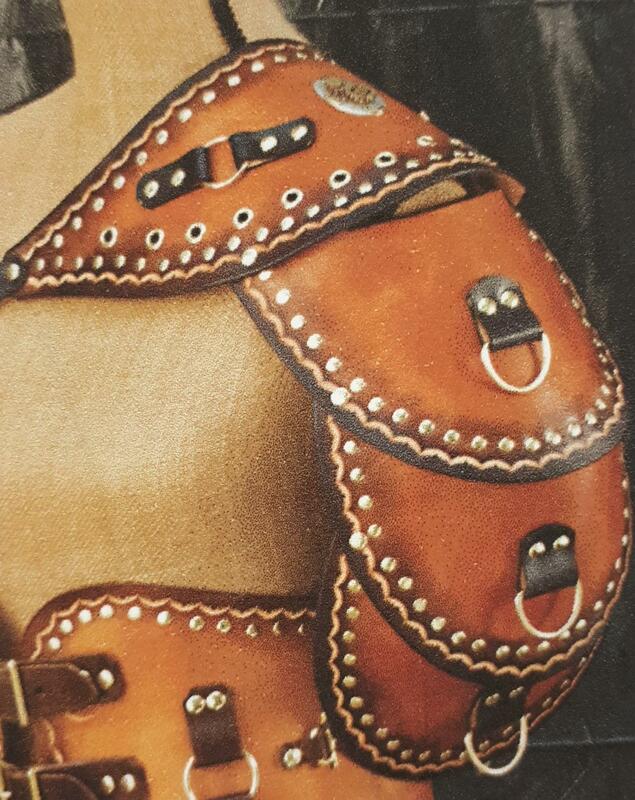 In this full day class, you will learn how to cut from a pattern, bevel edges, emboss, block dye, and assemble this quirky shoulder armour which can give you the skills you need to create similar pieces or more of the same! We will use 2.5mm natural veg tanned cowhide, to give the look of heavy duty armour, without the weight. For the novices, we can practice stamping on scrap leather before attempting your masterpiece. Burnishing edges will finish off your professional look, including setting your buckle and hardware. Loads of fun, but beware: we need to concentrate on the task at hand to be able to finish in one day! Why not take advantage of the $7 healthy lunch option available on the day. New dates have been secured for 2 courses in March and April! 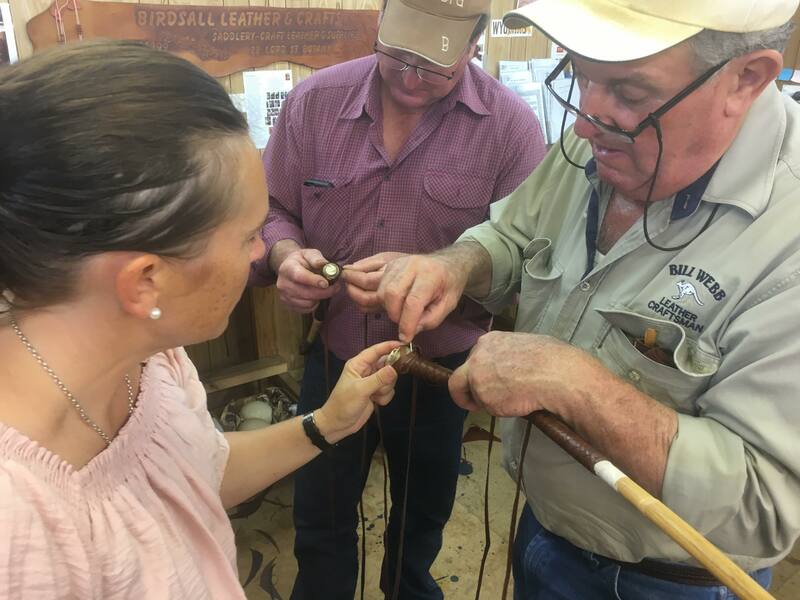 All skill levels can join one of Queensland’s finest plaiters, Bill Webb and learn how to plait a kangaroo whip over three days. 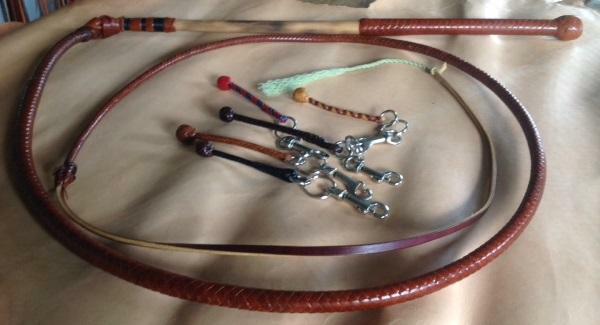 You will learn from scratch how to cut from the hide, skive the edges and plait around a core to create a beautiful, practical whip using quality hand stuffed Kangaroo leather. Bill will take you through all of those processes with detailed explanations to product some fine neat plaiting and what pitfalls to look for. When you prepare your lace, you will learn about proper lubricants whilst plaiting to keep your project smooth and flowing. Take advantage of the $7 healthy lunch option on the day. 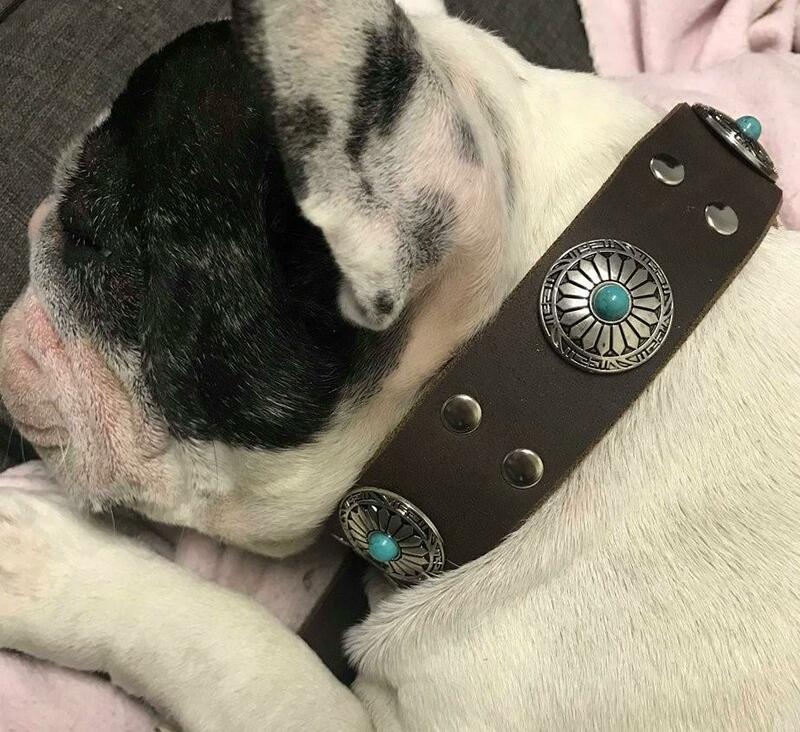 BELT MAKING OR DOG COLLARS! 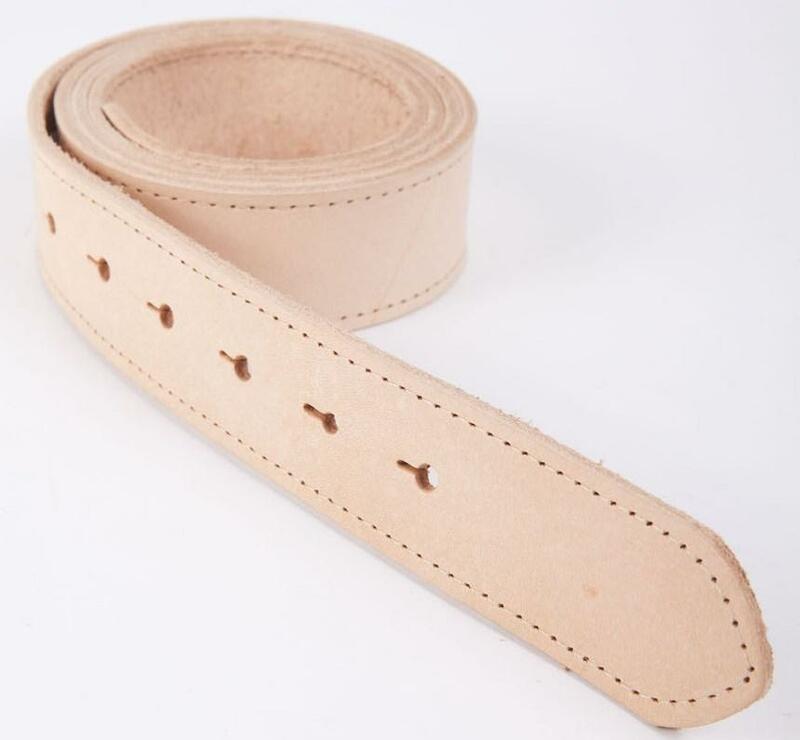 Learn the principals of belt making in this fun workshop where you can emboss & colour on natural veg tanned cowhide, or add bling to a pre-coloured belt length to call your own. 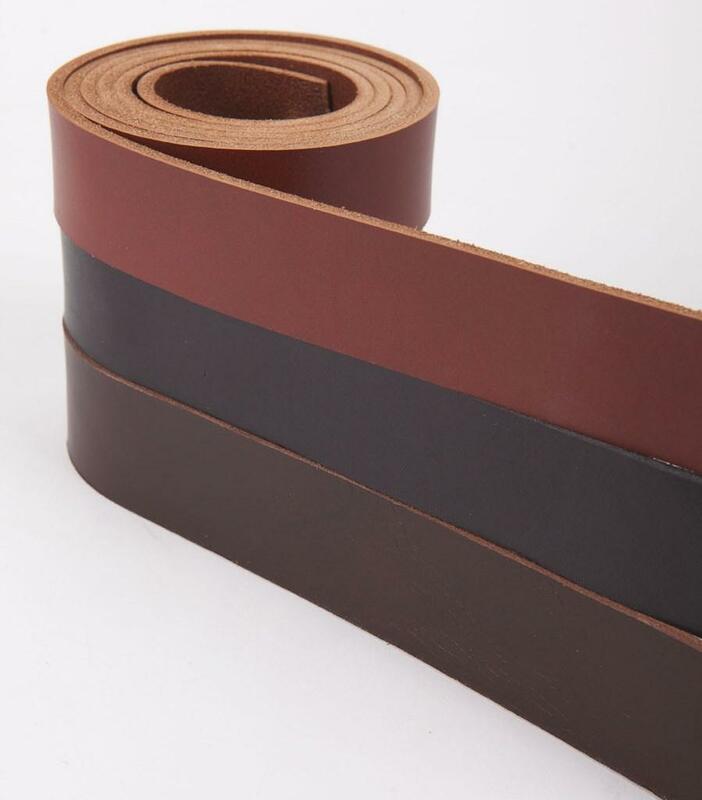 You will learn to correctly measure you belt length, bevel your edges and decorate to your liking including embossing and dyeing if you wish. You can practice on some scrap leather if you are tooling. 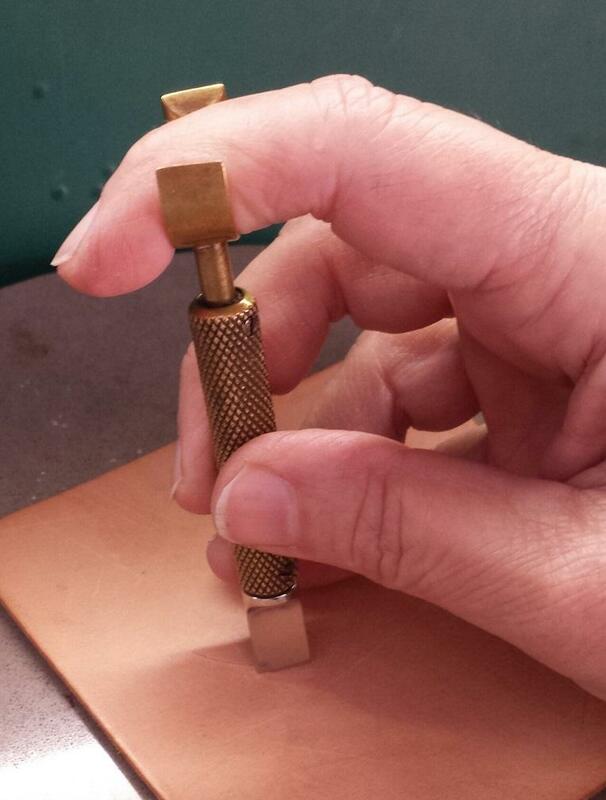 Burnishing edges will finish off your master piece, including setting your buckle and hardware. Loads of fun! AND the same rules apply to dog collars. Have the measurement of your dog's neck and off we go. Standard nickle plated full buckle, or half buckle and keeper. Please note: At extra cost, brass, trophy and special buckles are all available in store, plus any extra conchos or embellishments or bling! IMPORTANT: Please have the waist or hip measurement of the person you are making the belt for! This is mandatory for the right fit! 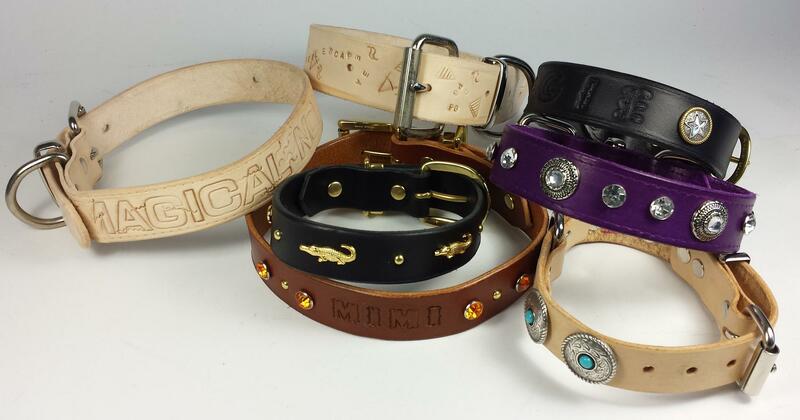 Have you ever wanted to personalise a collar for your dog, making it just the way you want? 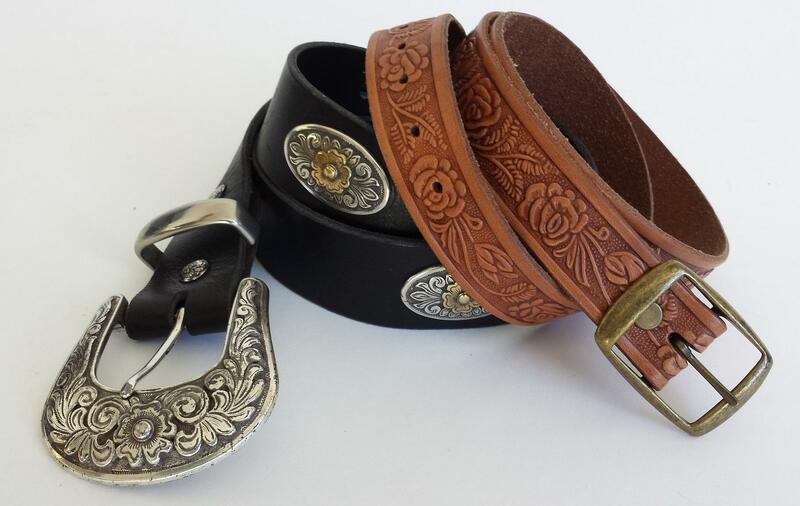 In this workshop, you will walk away with your own handmade collar complete with embossing or extra hardware like conchos and studs. Otherwise, just plain and stitched in a cool colour. Your choice. Loads of options to choose from including brass hardware for dogs who enjoy the water. 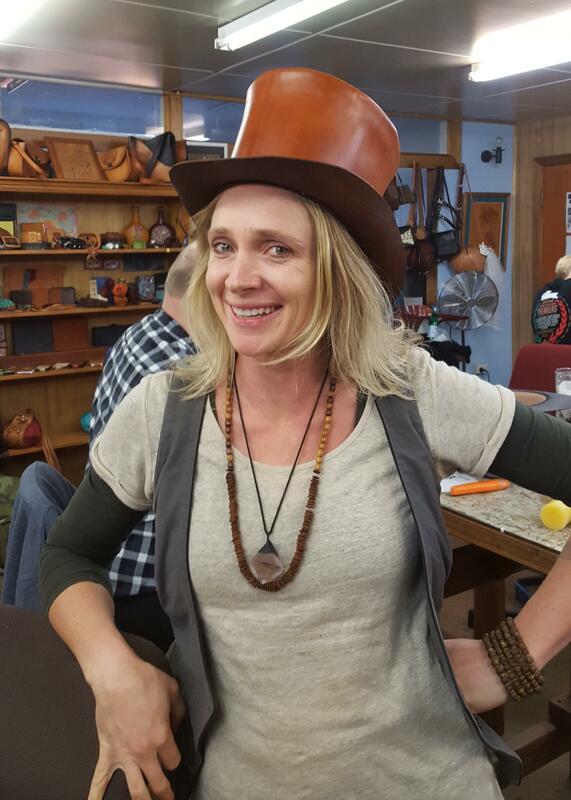 Cost includes a 4-hour workshop, leather, standard buckles & hardware, and use of all tools & dyes. Important!! 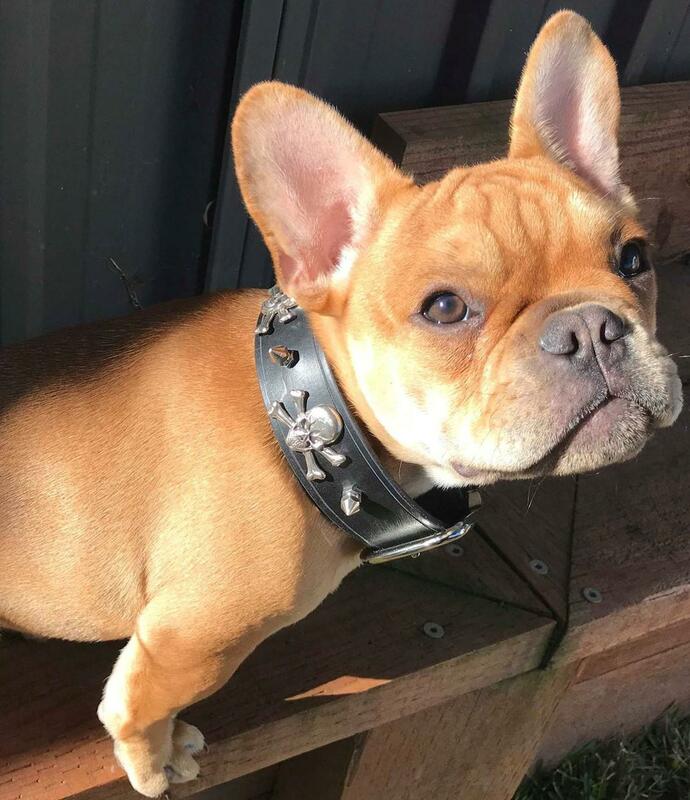 Please have your dog's neck measurement or an old collar to measure from. DID YOU KNOW? You dont have to wait for this class. 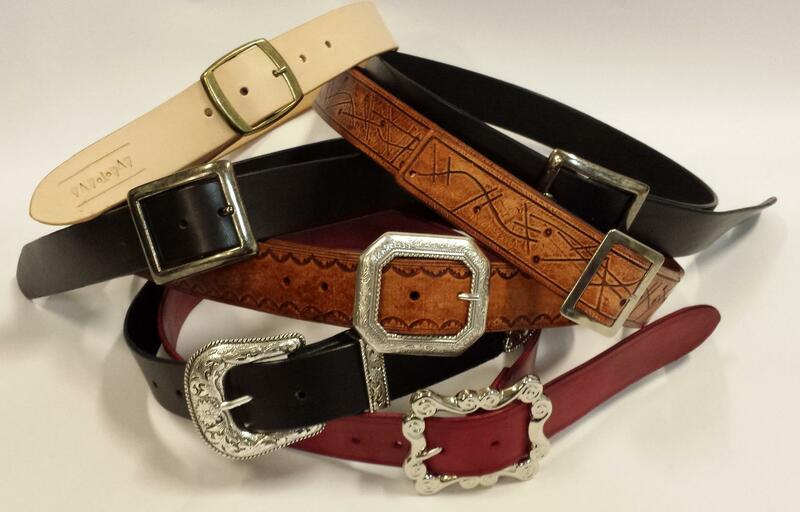 You can make a belt or dog collar in any Tuesday or Saturday Open class. Brass & chromed brass hardware available plus loads of conchos and embellishments to choose from. Harness needles and thread if you're stitching. Perhaps an old collar you'd like to replicate. 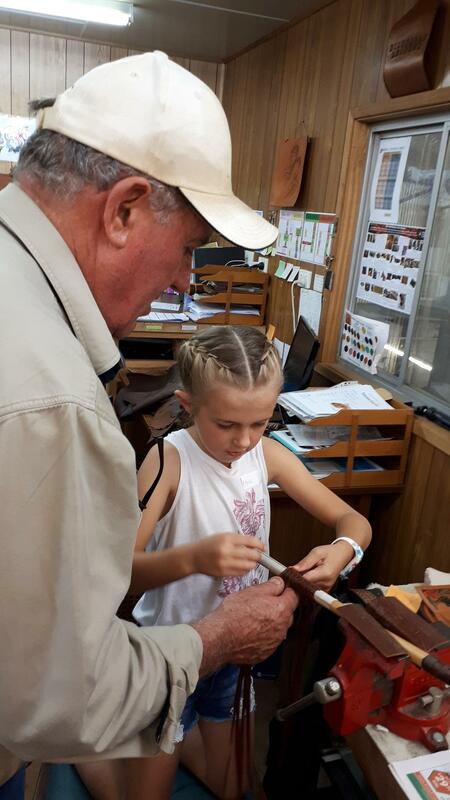 Learn the basic skills of traditional tooling by carving with a swivel knife and using bevelling, background and decorative tools. 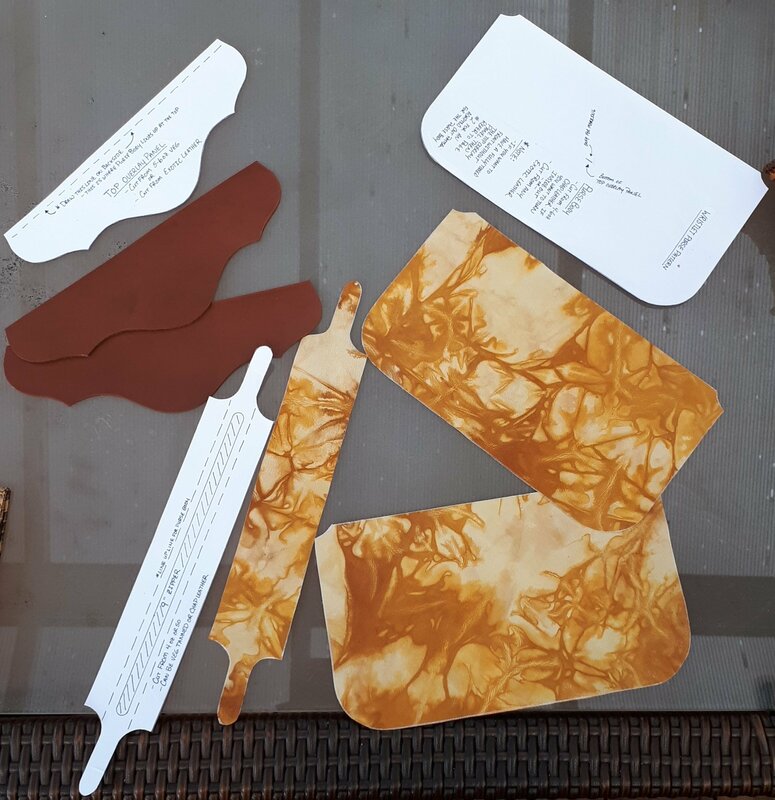 Firstly, you will practice your carving and tooling skills on scrap leather, using a simple craftaid template, with long flowing lines, to get your skills up. 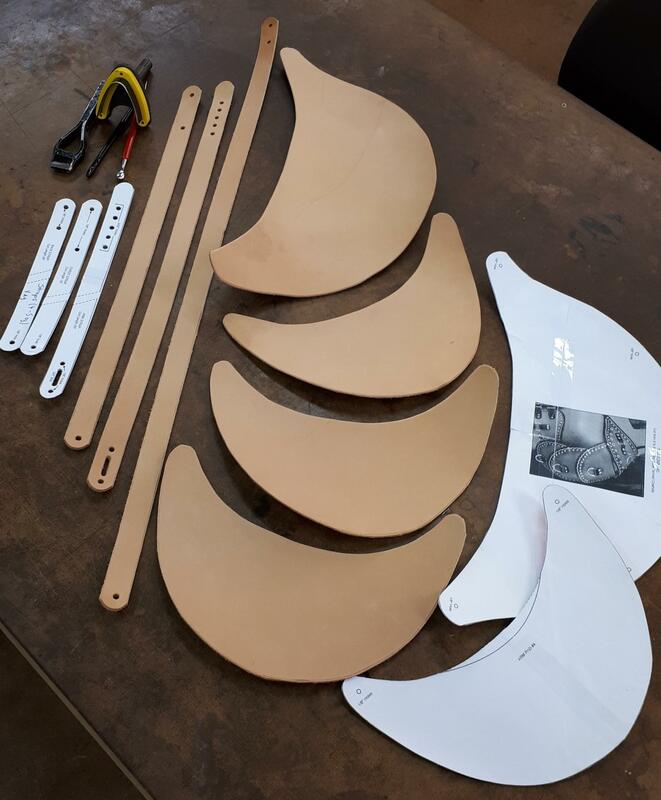 Then we will work on a masterpiece from the multitudes of (more simple) Craft Aid templates that you can choose from, on natural veg tanned leather. 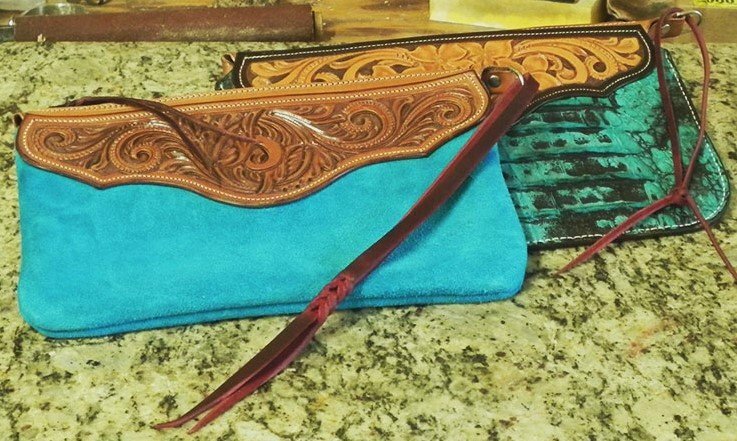 pictured above is a beautiful version, tooled by Peter Main, of the craftaid used in this class to help you learn about the tools used for traditional leatherwork. You will learn how to handle a swivel knife, how deeply to cut, and then which sides of the lines to bevel to create shadow and dimension. Back grounding, modelling and pearshading come next to complete your basic training. We will antique our work which will sit in the grooves and impressions and bring this piece to life. Some tools will be available in the workshop to be shared amongst students. Bring your own tools if you have them. Purchase a complete set of required tools, (normal RRP @ $225.00) for the super discounted price of $187.00! 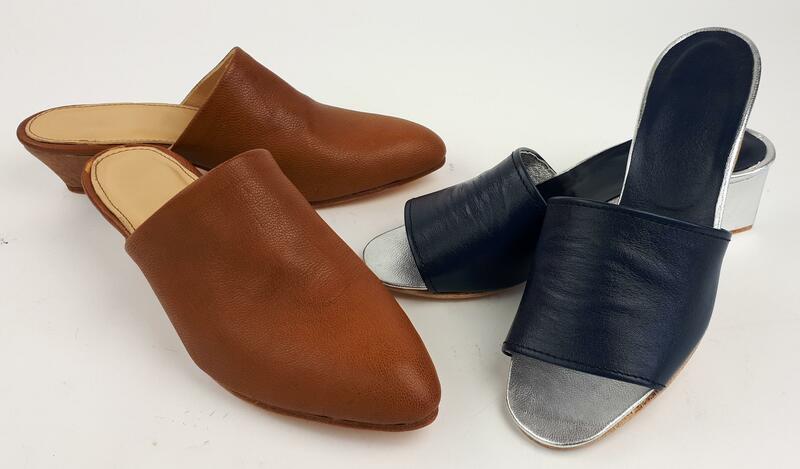 Learn to make a pair of custom made shoes from start to finish! Skills you will learn include pattern making, cutting, machine skiving & machine stitching, folding, colouring, hand lasting, last building & edge finishing. 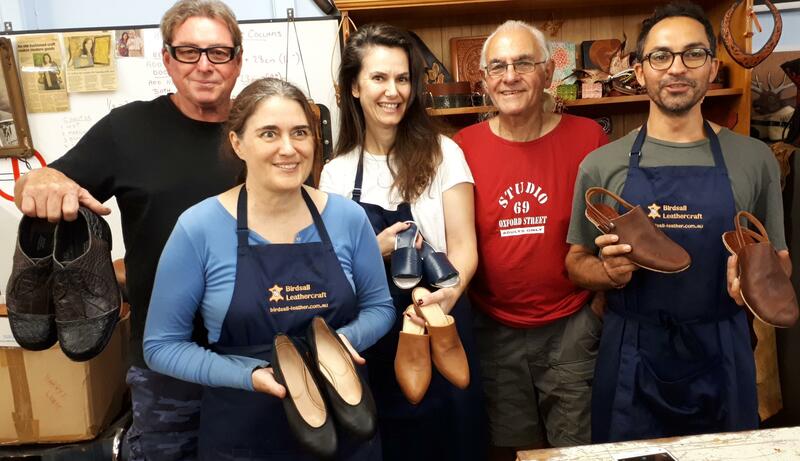 Both 6 week courses on consecutive Saturdays, or an intensive one week (5 day) course are on offer throughout the year with master Italian shoemaker, Mario Dato who has over 50 years experience. Perhaps bring a pair of old shoes you'd like to replicate or a photo of them! 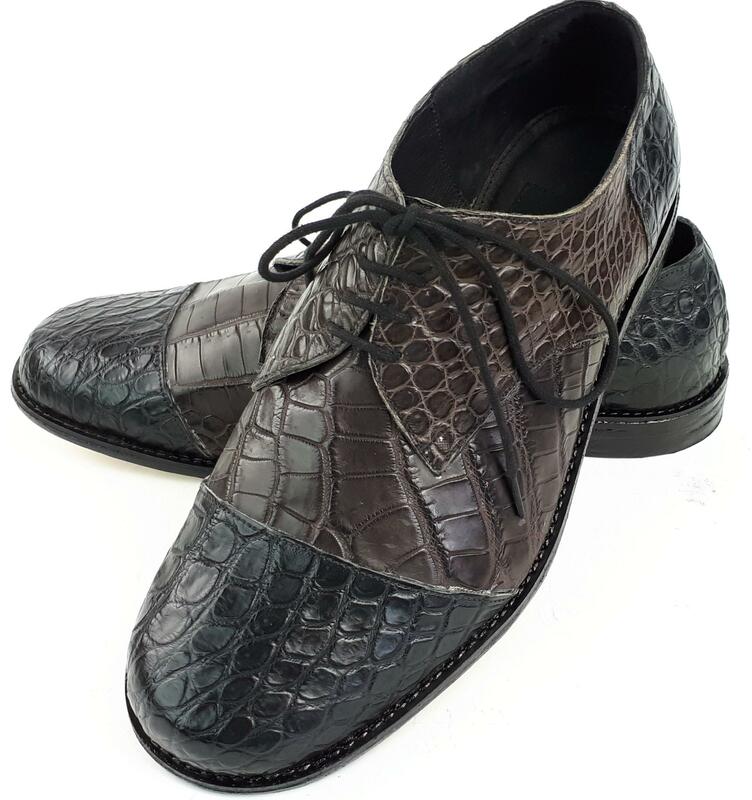 Cost: $755.00 for a 6 or 5 day course & a pair of shoes! 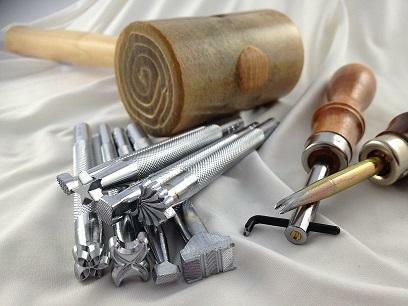 · Tools to keep: shoe hammer, lasting pincers, tack knife, clicking handle & blade, scratch awl, magic pen & apron - value: over $250!! 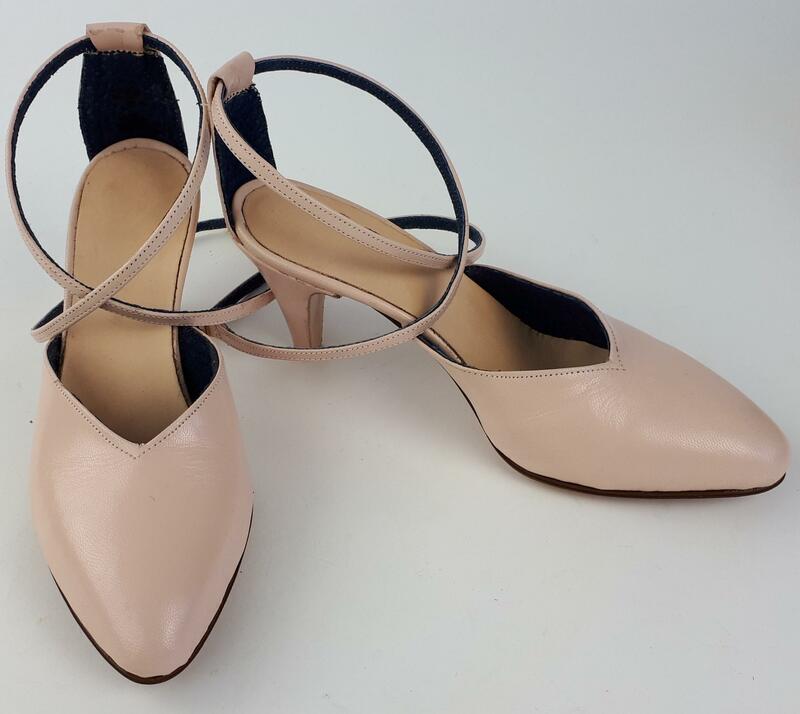 Compulsory: Closed shoes & no loose clothing or hair Take advantage of the weekly payment system for the six week course of $130p/w for those of you a lump sum who prefer not to pay up front. Finding the time slots difficult to attend? Or you don't need a full course? We are introducing PRIVATE TUITION with Mario Dato which can fall on any day except Thursdays, Fridays or Sundays! Exciting stuff! Take advantage of the brilliant tuition you'll receive with Mario at the rate of $60/hour (minimum 2 hours). Email silvia@birdsall-leather.com.au for more info. New dates available..... Back by popular demand! 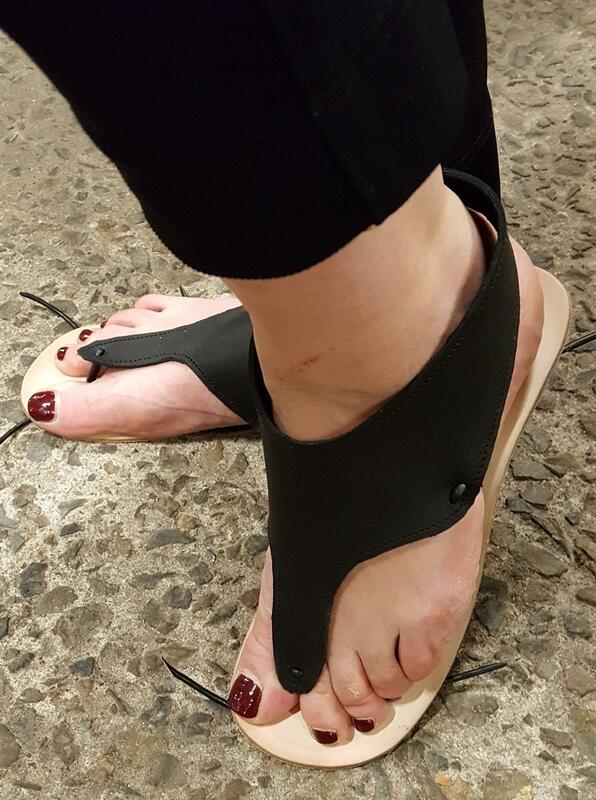 Would you like to learn how to make, AND walk away with a brand new pair of custom made leather thongs (Jandals)? 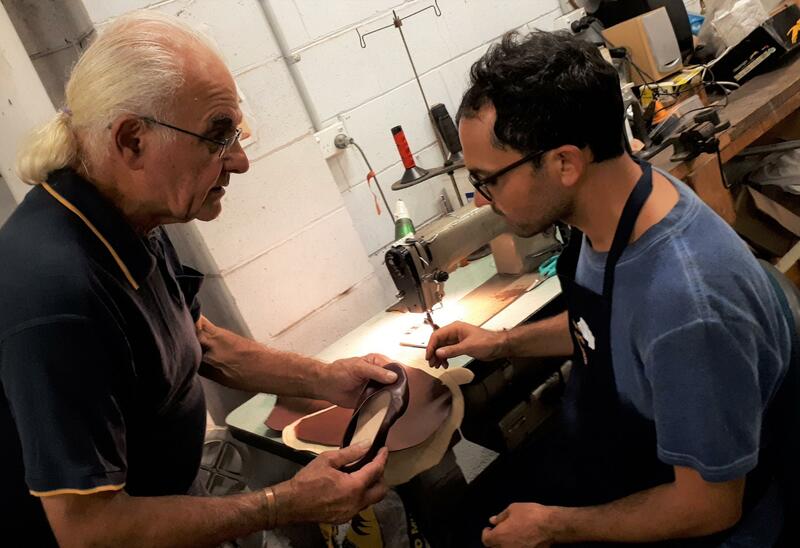 Master Italian shoemaker, Mario Dato, who has over 50 years experience will show you how to cut, shape, dye and assemble some simple, comfortable footwear, namely leather thongs. 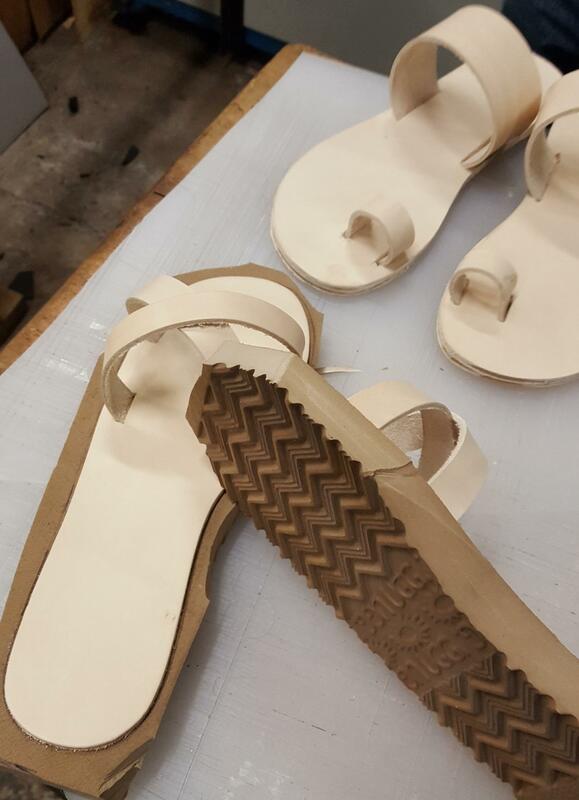 Different designs are available in subequent Jandal workshops which will be advanced classes. 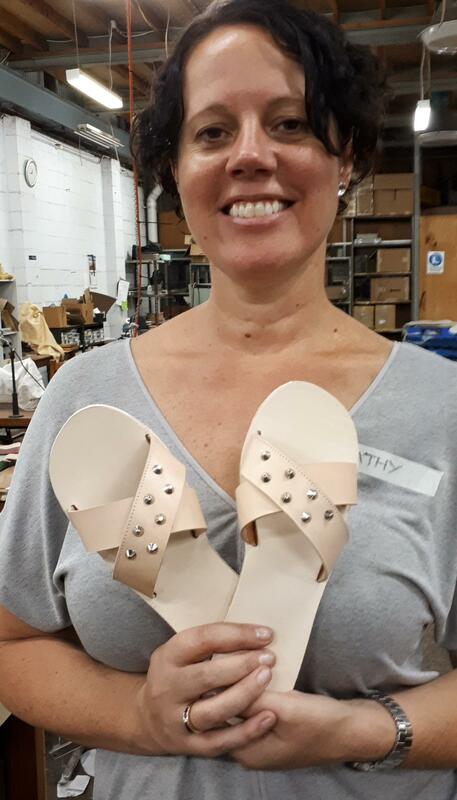 You need to email Silvia with your current thongs size, and make sure you have closed in footwear on the day, hair tied back and no loose clothing, as you will be using machinery in the workshop. Extra tools can be purchased at Birdsalls, or bring your own tools if you have them. 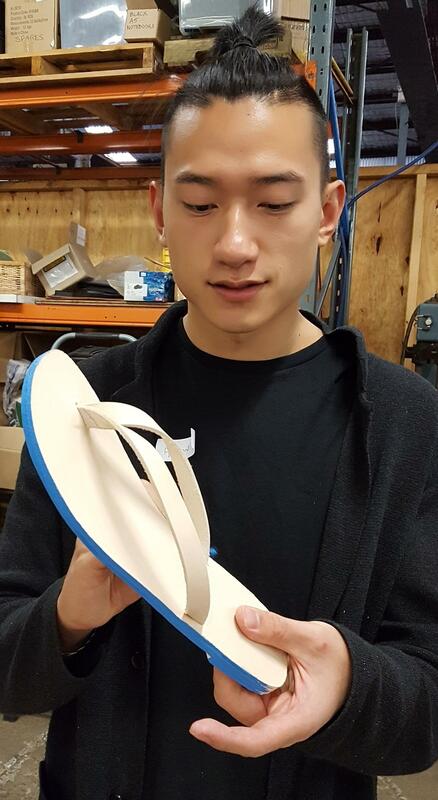 Cost: $130.00 for a 5 hour workshop and a pair of shoes! Payment in full is required in advance to secure your spot. Credit card, Direct Deposit or cash are acceptable. We have good, clean, old fashioned pub style accommodation, literally walking distance across the road, at some great negotiated rates of $110/night if youre travelling from afar, and youd like to stay local overnight, or longer! Email silvia@birdsall-leather.com.au for details. Cant get much closer!